Fourth Row Center: Film Writings by Jason Bailey: On DVD: "Andy Barker, P.I. : The Complete Series"
Andy Barker, P.I. lasted all of six episodes, while According to Jim made it to 182. That single sentence may contain everything you need to know about the current state of network television comedy, but I suppose I’ll write the review anyway. In all fairness, Andy Barker may very well have been too quirky and odd for network success. The brainchild of Conan O’Brien and co-creator Jonathan Groff, the single-camera, laugh track-free absurdist riff on detective fiction might have done better on cable or premium TV (where the noticeably similar Bored to Death is now thriving)—perhaps there it would have been better appreciated by a niche audience. It marked star Andy Richter’s third attempt at a starring vehicle, after the longer-lived but similarly mistreated Andy Richter Controls the Universe and the loved-by-no one Quintuplets; unlike his first show, which took a few episodes to nail its particular tone, Andy Barker roars out of the gate strong and never falters. It’s a shame an audience wasn’t there to follow it. Richter plays the title character, a CPA who is starting his own practice in a strip mall, where his neighbors include video store owner Simon (Tony Hale) and Afghani restaurant owner Wally (Marshall Manesh). In the pilot episode, he is mistaken for the previous resident of his office space, tough-talking private eye Lew Staziak (Harve Presnell). But he finds he has a knack for the detective biz, so he pursues it as a sideline while continuing to work as an accountant, occasionally inter-mingling the two disciplines. O’Brien and Groff hit the jackpot in their casting; the show is overstuffed with able, uproarious supporting players. Hale, best known for his iconic turn as “Buster” on Arrested Development, is very funny as a would-be sidekick; he gets to show some range, which is good, but his Simon ultimately shares Buster’s relentless need to please, and that’s a quality that’s welcome. Manesh’s Wally is an enjoyable comic creation; his kebab restaurant is decked out with red, white, and blue on every vertical surface; “He went a little overboard with the patriotic stuff after 9/11,” notes Simon. Clea Lewis, as Andy’s sweet and supportive wife, is a charmer, though Presnell (the gruff father-in-law from Fargo) pretty much steals the show—he growls his noir patoire through clenched teeth, jabbing Andy and Simon with perfectly-aimed insults and spewing uproariously inappropriate non-sequiturs at will. But Richter is the star, a generous and charismatic performer who shows here (as he did on Andy Richter Controls the Universe) that he’s more than capable of carrying a show on his doughy shoulders. That episode also showcases the series’ other masterstroke; when you strip away the goofiness and parody, these are actually pretty good mysteries. 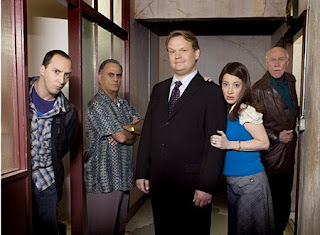 Goff and the show’s writers understand that, in some peculiar way, the show works better by situating it within the real world, and by making Andy a genuinely nice guy who’s actually good at what he does; the comedy comes from his gee-whiz reactions to crime and vice (seeing a set of blackmail photos, he exclaims with genuine shock, “These are dirty!”), and from the character comedy of the excellent ensemble cast. There is one element that feels like a bit of a missed opportunity. Nicole Randall Johnson (from MADtv) guests on the pilot as newspaper archive clerk who Andy bests; on the next episode, she shows up at his office and announces that since he got her fired, she works for him now. Johnson is a brilliant comedienne with a welcome, arid-dry wit, and Simon displays an immediate (and funny) attraction to her that seems a promising running gag. But she disappears after that episode with no explanation; on the commentary track, the producers muse that she couldn’t get away from MADtv, but it seems odd to leave her role hanging as they do. Some of the jokes are a touch obvious (like Hale’s slapstick roll across the hood of a car in the pilot episode, or a week marijuana/munchies payoff in “Dial M for Laptop”), sure, and the device of ending episodes with an unresolved cliffhanger is clever, but inconsistent (it’s only done intermittently, on half of the shows). But each episode builds terrific comic momentum (stuffing in running jokes and throwaway bits), punctures the usual clichés, and spices up the inevitable action climaxes with funny twists (like a golf cart chase or a misfiring antique gun). When we get a “ticking clock” episode, the clock isn’t a bomb, but the income tax filing deadline. And when Andy is working two cases at once (as every detective must do), one of them is the search for his daughter’s favorite stuffed toy. Director Jason Ensler shoots the show stylishly, delving into the dark and shadows without spoiling the jokes. Andy Barker, P.I. is a little gem of a show, waiting to be discovered and appreciated. It would be easy to pinpoint the speedy dismissal of Andy Barker, P.I. as yet another example of network impatience (NBC had pulled the plug by the fourth airing), but that’s all sour grapes. I’ll choose to be thankful for the episodes that we got, and the fact that they got out with the show’s purity intact. What the hell, they only did six episodes of Police Squad! too. "Andy Barker, P.I. : The Complete Series" hits DVD on Tuesday, November 17th.